Knowing that how therapeutic a music can be to someone who is deeply into this can easily interpret what scientist finally come up with. The researchers finally reached to a conclusion where they showed exactly how a perfect melody can have a soothing or disturbing effect on cats. But at the same time they concluded that human music is a poor way to explain what actual ‘MUSIC’ seems like. “We looked at the natural vocalisations of cats and matched our music to the same frequency range, which is about an octave or more higher than human voices,” lead author Charles Snowdon explained to Jennifer Viegas for Discover News. The drumbeat in human music usually mimics the human heartbeat and since this is the phenomenon followed, cat music also does the same. The team of the two universities mentioned above tried compiling things up which actually attract the cats towards them. One of the songs composed featured a suckling tempo and the other had a purring tempo. The case study featured 47 domestic cats when music was played in front of them and then a comparison was conducted between their reactions when this music was played and when human music was played. 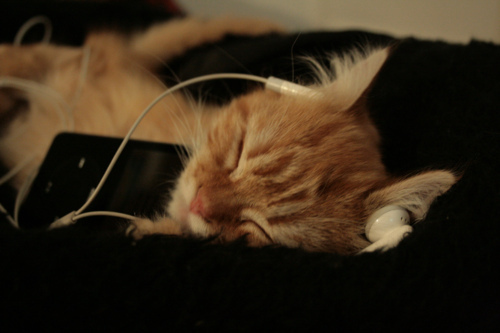 Publishing in the Journal Applied Animal Behavioral Science, the team also reported that almost all cats didn’t even bothered responding to human songs at all. However with the start of cat music, cats showed utter excitement and started reaching towards the speakers and started rubbing their scent glands on them which explains that they were trying to claim the speakers as theirs property.